Gametogenesis is the process whereby a haploid cell (n) is formed from a diploid cell (2n) through meiosis and cell differentiation. Gametogenesis in the male is known as spermatogenesis and produces spermatozoa. Gametogenesis in the female is known as oogenesis and result in the formation of ova. In this article we shall look at both spermatogenesis and oogenesis. Males start producing sperm when they reach puberty, which is usually from 10-16 years old. Sperm are produced in large quantities (~200 million a day) to maximise the likelihood of sperm reaching the egg. Sperm are continually produced as males need to be ready to utilise the small window of fertility of the female. Sperm production occurs in the testes of the male, specifically in the seminiferous tubules. The tubules are kept separate from the systemic circulation by the blood-testis barrier. The blood-testis barrier is formed by Sertoli cells and is important in preventing hormones and constituents of the systemic circulation from affecting the developing sperm, and also in preventing the immune system of the male from recognising the sperm as foreign – as the sperm are genetically different from the male and will express different surface antigens. Sertoli cells also have a role in supporting the developing spermatozoa. Spermatogonia are the initial pool of diploid cell that divide by mitosis to give two identical cells. One of these cells will be used to replenish the pool of spermatogonia – these cells are A1 spermatogonia. This replenishment of spermatogonia means that males are fertile throughout their adult life. The other cell – type B spermatogonium – will eventually form mature sperm. Type B spermatogonia replicate by mitosis several times to form identical diploid cells linked by cytoplasm bridges, these cells are now known as primary spermatocytes. Primary spermatocytes then undergo meiosis. The cytoplasmic bridges break down and the spermatids are released into the lumen of the seminiferous tubule – a process called spermiation. The spermatids undergo spermiogenesis (remodelling and differentiation into mature spermatozoa) as they travel along the seminiferous tubules until they reach the epididymis. From the seminiferous tubule they travel to the rete testis, which acts to “concentrate” the sperm by removing excess fluid, before moving to the epididymis where the sperm is stored and undergoes the final stages of maturation. Spermatogenesis takes approximately 70 days, therefore in order for sperm production to be continuous and not intermittent, multiple spermatogenic processes are occurring simultaneously within the same seminiferous tubule, with new groups of spermatogonia arising every 16 days (spermatogenic cycle). Each of these populations of spermatogenic cells will be at different stages of spermatogenesis. Note that once sperm leave the male body and enter the female reproductive tract, the conditions there cause the sperm to undergo capacitation, which is the removal of cholesterol and glycoproteins from the head of the sperm cell to allow it to bind to the zona pellucida of the egg cell. Oogenesis differs from spermatogenesis in that it begins in the foetus prior to birth. Primordial germ cells (which originate in the yolk sac of the embryo) move to colonise the cortex of the primordial gonad and replicate by mitosis to peak at approximately 7 million by mid-gestation (~20 weeks). Cell death occurs after this peak to leave 2 million cells which begin meiosis I before birth and are known as primary oocytes. Therefore, a human female is born with approximately 2 million primary oocytes arrested in meiosis and these make up a finite supply of potential ova. The primary oocytes are arranged in the gonads in clusters surrounded by flattened epithelial cells called follicular cells and these form primordial follicles. The primary oocytes are arrested in prophase stage of meiosis I. During childhood, further atresia (cell death) occurs, leaving ~40,000 eggs at puberty. Once puberty begins, a number of primary oocytes (15-20) begin to mature each month, although only one of these reaches full maturation to become an oocyte. The primary oocyte grows dramatically whilst still being arrested in meiosis I. The follicular cells grow and proliferate to form a stratified cuboidal epithelium. These cells are now known as granulosa cells and secrete glycoproteins to form the zona pellucida around the primary oocyte. Surrounding connective tissue cells also differentiates to become the theca folliculi, a specialised layer of surrounding cells that is responsive to LH and can secrete androgens under its influence. Fluid filled spaces form between granulosa cells, these eventually combine together to form a central fluid filled space called the antrum. The follicles are now called secondary follicles. In each monthly cycle one of these secondary follicles becomes dominant and develops further under the influence of FSH, LH and oestrogen. (See article on the menstrual cycle). The LH surge induces this stage and meiosis I is now complete. Two haploid cells are formed within the follicle, but they are of unequal size. One of the daughter cells receives far less cytoplasm than the other and forms the first polar body, which will not go on to form an ovum. The other haploid cell is known as the secondary oocyte. 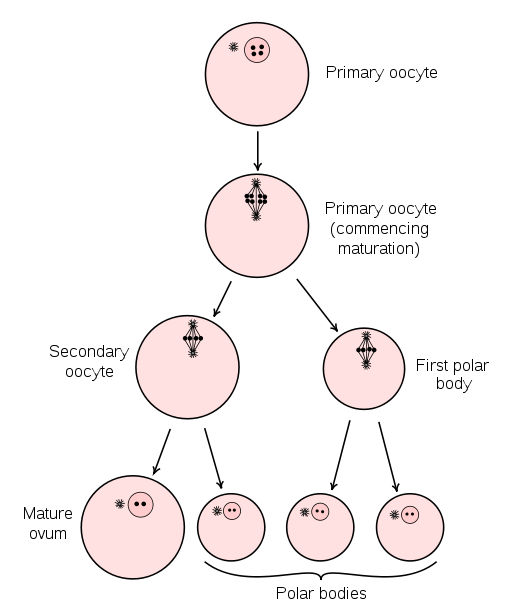 Both daughter cells then undergo meiosis II, the first polar body will replicated to give two polar bodies but the secondary oocyte arrests in metaphase of meiosis II, 3 hours prior to ovulation. The follicle has grown in size and is now mature – it is called a Graafian follicle. The LH surge increases collagenase activity so that the follicular wall is weakened, this combined with muscular contractions of the ovarian wall result in the ovum being released from the ovary and being taken up into the fallopian tube via the fimbriae (finger-like projections of the fallopian tube). The secondary oocyte will only complete meiosis II on fertilisation, giving off a third polar body once meiosis II is completed and a fertilised egg. If fertilisation never occurs, the oocyte degenerates 24 hours after ovulation, remaining arrested in meiosis II. If the egg is fertilised however, the peristaltic movements of the fallopian tube move the egg to the uterus where it can implant into the posterior uterine wall. What are the cells that are produced as a result of meiosis I in spermatogenesis called? How long does spermatogenesis take approximately? During the pre-antral stage of oogenesis, what do the follicular cells proliferate to form? When in the lifetime of a female will she have the most number of potential eggs?